Your data is powerful, which is why you need tools to harness it for smarter business decisions. Power BI and Dynamics 365 work side by side to deliver valuable insights that help you monitor your business, align departments, and anticipate customer needs. 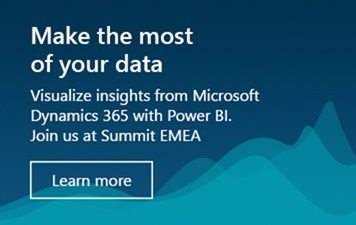 If you’re looking for new ways to use data visualizations, don’t miss this opportunity to attend Summit EMEA, a three-day experience for Dynamics users with a dedicated track for Power BI. You’ll learn about the latest Power BI updates and see what’s possible when you use Power BI and Dynamics 365 together. Dig in by creating your own Power BI report and see how easy it is to find trends in your Dynamics 365 data. Take a deeper dive into Power BI apps for Dynamics 365, and learn how to customize them for your specific needs. Summit EMEA is a peer-to-peer conference that gives you direct access to new product insights and real-life applications. The Power BI track delivers informative sessions targeted to your industry and interests. You’ll be surrounded by people who use Power BI with Dynamics and want to share their challenges and solutions. Customize your schedule based on industry, role, and skill level with sessions suitable for everyone, from IT executives to end users. Newcomers and experts are all welcome. Plus, a Power BI panel will showcase successful companies that are using intelligent apps and modern BI. While learning and networking at Summit EMEA, you’ll also have the chance to explore the beautiful city of Amsterdam. The event is held in the state-of-the-art RAI Amsterdam, just 15 minutes from the airport and 8 minutes from Amsterdam’s historical center.